‘Green is the new black’. Are you tired of simplistic eco slogans and soundbites yet? This may come as a bit of a surprise — but I’m really starting to hate Earth Day. One might think that the editor of environmental-leaning publication like Inhabitat would live for Earth Day, but the opposite is true for me. I’m starting to come to the conclusion that Earth Day is just a shallow marketing opportunity for companies to jump on the green bandwagon and try to make some extra cash using eco-caché. Having one single day designated as Earth Day gives people and corporations an excuse to pay less attention to the environment the other 364 days of the year. The greenest and most innovative companies are not the ones running Earth Day marketing campaigns and giving out eco totes on April 22nd. In fact, you wouldn’t believe some of the ridiculous green-themed press releases I received over the past few weeks leading up to Earth Day. Read on for five of the most egregious examples of greenwashed Earth Day marketing gimmicks I’ve seen, and chime in with the most ridiculous gimmicks that you’ve run across in the comments – we’ll be collecting your submissions and adding them to our post! “Eco-friendly’ bottled water campaigns focused around Earth Day are the worst examples of greenwashing I’ve ever seen. Poland Springs claims that its bottled water is green because of a special eco-shaped plastic bottle. What is an eco-shape exactly? According to Poland Springs ‘As part of our ongoing effort to reduce our environmental footprint, we redesigned our new bottle and cap to contain 30% less plastic than our original bottle’. Gee, thanks Nestle Corporation – that is so ‘eco’ of you! What would actually be a lot greener, however, would be to stop putting tap water in plastic bottles, calling it ‘spring water’, and then marketing it to consumers as healthy and better-for-you than municipal water, thus spewing millions of tons of carbon into air and the clogging up landfills with 50 billion non-biodegrading ‘recyclable’ plastic bottles per year. A few years ago on Earth Day I received a very large box in the mail (by large I mean 3 ft X 2ft X 2 ft). I had no idea what it was, so I excitedly dug into the suspiciously light-for-its-size box, only to discover it was completely full to the brim of styrofoam packing-peanuts. I kid you not – at first I thought this was a practical joke, because there was NOTHING in the box except packing peanuts. Then, finally, after I rifled through all the packing peanuts, at the very bottom of the box, I found a press release and a snack-size 2X3″ mini-bag of ‘eco’ potato chips! What makes a tiny plastic bag of processed junk food ‘eco’, you ask? Apparently sending them to an editor surrounded in 12 cubic feet of styrofoam! 3. Wasteful Earth Day marketing campaigns that totally miss the environmental point. In my email inbox a few weeks ago I received an invitation to promote an ‘Earth Day’ contest which asked people to send in bottled water bottles in order to win a getaway to ‘green’ spa. The contestant who sent in the most bottles would win a trip across country to an ‘eco’ spa. This is just wrong and so senseless on so many levels. First of all: encouraging people to compete to see who can send in the most water bottles encourages people to BUY bottled water, which encourages bottled-water companies to keep making bottle water, and bottle water is a HUGE waste of energy, plastic, carbon emissions and landfill space. And then having the prize be a weekend ‘getaway’ across the country is a guarantee to spew 4,911 lbs of CO2 into the air – air travel is another huge contributor to greenhouse gases. So what is ‘green’ about any of this? Apparently the spa in question is LEED certified. Unfortunately the giant carbon footprint of this whole competition and marketing campaign undermines any green credibility that the spa might have otherwise had. The idea behind carbon credits is simple enough — pay to offset your CO2 emissions from, say, flying across the country, and an organization will negate the emissions by planting trees, launching renewable projects, or initiating some other sort of carbon-reducing project with your cash. There are a number of problems with this. It’s hard to judge the reputability of organizations that sell offsets — some projects are never completed (or started), and many CO2-offsetting projects would have been initiated anyway. A recent investigation by the Christian Science Monitor confirmed these suspicions. A company called 3Degrees, for example, shills offsets at a carbon kiosk in San Francisco International Airport. But the CSM found that 3Degrees actually just gives money to the Nature Conservancy and the Conservation Fund to — get this — leave trees standing on land the environmental groups own. Beware of ‘too-good-to-be-true’ one-stop fixes to your carbon footprint, which involve buying your way out of carbon emissions instead of changing your lifestyle. There are no silver bullets. Stop the eco-tote insanity, people! Sure, we all know that plastic bags are horrible for the environment and that using reusable totes to carry your groceries is the eco-friendly thing to do. But producing millions of these eco totes and handing them out at every event, or worse, emblazoning a really shoddily-made bag that wouldn’t last 2 weeks with your company logo and the word “green” and selling them is just insulting. Just because these bags are a grainy oatmeal color or have a picture of a leaf on them does not mean that they don’t take energy to make. In fact, most totebags take a lot more material, energy, labor, water and fuel to manufacture than plastic bags do. And I think most of us probably have at least 20 of these things already. I know I do. This Earth Day, take it upon yourself to think before you buy or accept a free “eco” bag – couldn’t you easily just use a bag you already have for the same purpose? We know that it’s difficult to turn away free stuff but why take it if it’s just going to end up being tossed away – which totally defeats the purpose of an “eco-friendly” bag in the first place! Yes, we’ll fess up, Inhabitat is complicit in the eco tote mania, and we did produce some eco totes a few years ago… but we’ll make ourselves feel better by saying that this was before they were easy to find at every grocery store and all y’all already had 20 of them in your closet. We’re not printing them anymore, because we don’t feel that the world needs more eco tote bags at this point. On a positive note, we love event organizers who’ve been practicing the art of “no-bag schwag.” Case in point: guests at the GreenShows eco-fashion events during this past NY Fashion week were treated to goodies placed neatly on their seats for them to tuck into their own purses and bags. Do you have an Earth Day gimmick to add to our list? 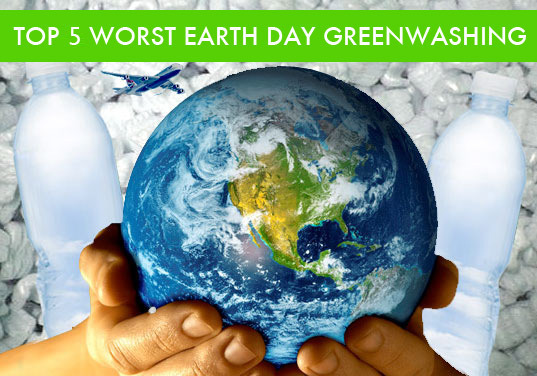 Submit the worst Earth Day greenwashing gimmicks youve seen (along with links to photos) in the comments below – we’ll choose the most egregious ones to add to our post! Everyone always assumes that Poland Spring water is tap water but your really are mistaken. Poland Spring water is still as it has always been, it is bottled from natural spring water sources from across the state of Maine. All of these sources are carefully selected for their natural properties and undergo very little treatment when going through the bottling facilities. These treatments include cleaning them and checking to make sure that they are in perfect condition for bottling and providing for the consumer. Unlike other companies such as Dasani which take city water and process/filter it to their desired levels, Poland Spring's sources are springs that have been naturally formed here in Maine. As for the bottles themselves, there is a 30% drop in the plastic thickness of the bottles that are produced and the shape of them has altered for being more ergonomic to the hand as well as to make up for the reduction in the amount of plastic present in the bottle. Instead of saying that Poland Spring is a company where they simply bottle tap water, you should look into things more and really know the process behind these things. The only time this water can be considered "tap water" is if you are one of the lucky individuals to live in the beautiful state of Maine and your home happens to be located over one of these massive underground springs and your well is able to tap into this. As a company, Poland Spring does so much for the community that people really arent too aware of. They constantly do water donations to schools, fire departments, police departments, and many events and small businesses. They make tremendous contributions to natural disaster reliefs where they supply clean drinking water to those who are in dire need. On top of the water donations they also make huge monetary donations to charities, schools, and provide scholarships for students planning to continue their education. They have received many national awards for the safety of their truck drivers and workforce and have also had the majority of their facilites reworked to use less electricity and to keep them within the requirements for being a "green" company. People have issues with bottled water and I can see both sides of this argument, but much of these recycling problems are people's simple dissregard for not choosing to recycle and to simply throw their bottles (doesnt matter what it is) in the trash. Until people start caring more for their actions and their environment, you cannot place all the blame on these water producing facilities. If a natural disaster were to strike, then what would you do? How would you provide clean water to all those affected by a hurricane without it becoming a drinking pool? Bottled water is not the enemy here, it is people's disregard and lack of care for the environment and their actions that we should be focused on. Tote bags or canvas bags or bags for life, depending where you come from, are a great bit of greenwashing. Figures I've heard say that 1 of those bags has the same foot print as 50 plastic bags So you'd have to use it 50 times to cover it's environmental cost. If I've got one I'll try and reuse it, but only because I got it free with something else and I'm really trying to hit that 50 mark. Not necessarily an earth fay gimmick but a leading fashion retail in Hong Kong put up a couple of green clothes right next to a neon light slogan "Go green to save the planet". Most insulting of all I have ever seen. There are so many, but I think you snagged the best five! The Sun Chips incident reminds me of Philadelphia's "Go-Green" campaign. SEPTA, the area's transportation system, was running a campaign to boost its eco-friendly appeal...but were packaging every two tokens (one round trip) in a plastic bag that read "Go-Green." It's easy to forget that 80% of people out there JUST DON'T GET IT. I really liked your post. Sharp, smart and funny! It indeed was a matter of time to see how companies would use the "eco-friendly label", even if they don't give a s*** about the environment. what about encouraging conspicuous consumption? or claiming that anything iphone related is green? or that anything done in bamboo is green without discussing it's source? or claiming paid advertisements are green? i think i've covered 90% of inhabitat posts now. seriously, you guys used to rock, now you're complaining when a company cuts 30% of it's plastic consumption, but pimping department stores? bottled water is NOT ideal, but it's necessary for disaster relief and the like. 30% less garbage in a disaster area? sounds like a big green win to me. great article. so sick of the reusable tote bag being touted as soooo great for the earth. I loved this article! I think it's great that Sun Chips bags are biodegradable but Sun Chips is owned by Frito Lay which does not use this new eco-bag with their products. Jill: A few facts regarding the certified carbon offsets from Garcia River you describe 3Degrees as “shilling”, as well as 3Degrees. - The Garcia River Project has been certified as a source of carbon credits using the Climate Action Reserve’s (CAR) Forest management protocols – one of the most prescriptive set of standards for forest management carbon projects in the world. -Redwood forests store more carbon per acre than any other forest type. Sustainable forest management of Garcia River enables the storage of more than 77,000 tons of carbon emissions annually. -Prior to its purchase by the environmental organizations you mention above, the Garcia River Forest was intensively logged, resulting in depleted inventories of merchantable timber, a network of fragile roads on steep slopes of eroding soils and miles of spawning habitat for salmon and steelhead clogged with sediment. - The non-profit Nature Conservancy and the Conservation Fund are not just “leaving trees standing on land they already own.” In fact, they are sustainably managing the forest to maximize carbon storage and accelerate the recovery of its ecosystem. For example, they are engaging in light-touch logging, whereby inferior trees are removed, promoting the growth of stronger trees that store more carbon and improve the forest’s ecosystem. -As required by the CAR rules, The Nature Conservancy holds a conservation easement on the property to ensure that it remains forest land through the project’s 100-year life and beyond into perpetuity. Even if the property is sold, it will remain forest land forever. -3Degrees does not believe that carbon offsets are a “silver bullet” for solving climate change. In fact, we advocate a Reduce. Renew. Balance. approach in which organizations and individuals should always first focus on lowering their GHG emissions through energy efficiency, conservation, and “greening” of their electricity usage. -3Degrees does believe that, even with such an approach, an individual’s or organizations’ activities can result in unavoidable GHG emissions. For those people and organizations that want to take responsibility for their environmental impact and reduce their unavoidable GHG emissions, high-quality certified carbon offsets are an intelligent and efficient tool for balancing out their emissions. If you would like to learn more, please visit the links below: CAR Forest Protocol: http://bit.ly/cCMAdD Details on the Garcia River Project from the Nature Conservancy: http://bit.ly/9C7GXX Details on the Garcia River Project from the The Conservation Fund: http://bit.ly/cwBjXV NPR story on the Garcia River Project: http://bit.ly/CTjZ1 3Degrees Reduce.Renew.Balance approach: http://www.3degreesinc.com/products/reduce_renew/ If after reviewing the above materials, you still believe the carbon offsets generated from the Garcia River Project to be an example of a Dumb “Greenwashing” gimmick and feel that by helping sell these offsets 3Degrees is violating, rather than realizing, its mission of working to reduce the magnitude of climate change, please let me know. Where I work for Earth Day they got a giant bounce house complete with generator! Then they changed the printer BACK to single sided on non recycled paper, and they are an institute of higher learning!!!!! What? Poland Spring is owned by Nestle? Maine Sal, are they using the original springs? I mean, it was real mineral water, sold in glass bottles...I feel like such a dinosaur. Well, I don't use bottled water, so it really isn't a problem for me. And I avoided earth day too, because of the hype. As for eco-totes - I just read of a way to make totes out of old sleeveless t-shirts. Maybe we can turn eco-totes into quilts or something. I agree and disagree. I think earth day is a great concept to get people thinking about the consequences of their actions. People who, until that point, really don't consider it. I agree! I am so tired of the marketing and paraphernalia that surrounds this day. I do like to mark Earth Day though to use it as a way to promote education and info.However, I think that there aren't quite enough canvas totes yet, because not everyone is using them. I do have about 20, and want no more, but I give them as gift bags to people to encourage more use. In my town, few people use the ones sold. I was one of the first and the baggers could hardly handle it, seriously, and then they started selling them too. They should be given out freely (even if its an ad) because not everyone is willing to pay for such a thing when the plastic/paper ones are free. I couldn't agree more about people jumping on the damn bandwagon. How about for Earth Day, we all: 1. Insulate our homes properly to retain heat and stop us wasting so much fuel heating the planet 2. Fix leaking or dripping taps in order to save water by the truckload 3. Drink from the tap or as the wife and I do, fill up a 10L water container with one of those tap thingies on it and stick it in the fridge so we can have cold water whenever we want instead of buying bottled water 4. Make triple-glazing mandatory (see point 1) 5. Make it a requirement that every new house built has to provide at least 25% (or whatever %) of its energy from solar (or other sustainable) means. Making solar panels so cheap that everyone would want one (or twelve) is the way forward people. 6. Unplug our mobile phone chargers from the wall where they are happily sucking power that goes nowhere. 7. Make kids that live within a certain radius of their school walk there instead of catching the bus or being taken in a huge 4x4 by their damn mothers. That's just 7, I could probably go on for days with all the crap that we could easily fix and really benefit the earth. Earth Day, schmerth day. Rant over. One more thing to add to all of this craziness is the repercussions of drinking water that has bin sitting in plastic that is continuously leeching plastic into the water and putting it into your body! Poland Spring does use spring water from 6 or 7 springs in Maine. I've read their whole site trying to find any waffling or hint that they may use other sources. I don't really trust Nestle. I think I'll ask customer service for the full Truth. You might be interested to learn that we're collecting signatures to put a referendum on our Maine ballot: to charge PS for the water they take out of OUR aquifers. That's sensible! Thank you for this article. This stuff is making me absolutely crazy!!! I am in the wedding industry and I keep hearing- Use Soy Ink to print your wedding invites. Last time I checked 98% of the soy we have in the country is GMO Roundup Ready. I shake my head! Kudos to you…but your bottled water argument was repetitive. Bet there\'s at least one other reason why you can\'t stand the Earth Day greenwashing. I would like to suggest, on the tote note: why not find a way to BAN plastic bags in your community instead? Personally, I bought tote bags and now I\'m getting them free, which is annoying in itself. But what I\'m very upset by is the same stores are STILL using plastic…knowing full-well that there bags are out there flying in the breeze and whoring-up the trees! I agree too. Why buy anything new, green or otherwise? We should continue to reuse our old stuff until it disintegrates. As a matter of fact, why even advertise any of this green apparel, eco lamps, furniture, etc., when we can continue to fix up what we already have? Stop being so obsessed with money. Has the green movement become totally commercial or what? Let's get it together people, live repsonsibly, and quit being posers! You know who you are. I agree with many of your remarks, but the Sun Chips styrofoam box seems like the marketers intended to attain free publicity. Why would you give them free advertising when they already know those pellets are a waste? Love this post! Thank you for sharing - I agree with so much of this. As nice as it is to see companies becoming more aware of their impacts on the environment, often the best thing we can do is live simply. Bringing your own water bottle is green and cost effective, buy bigger bags of potato chips (or don't eat them at all), reduce the number of times you travel if possible, and don't get obsessed with reusable bags (how many does one person really need?!). I had similar thoughts as I strolled through a park with the "play-in" water feature pumping water into the air (not a kid within sight,) the gigantic riding mowers (you know the kind) cutting the grass, the guys running their power edgers to give the grass that artificial look while the lawn sprinklers put 25% of their water on the sidewalks.